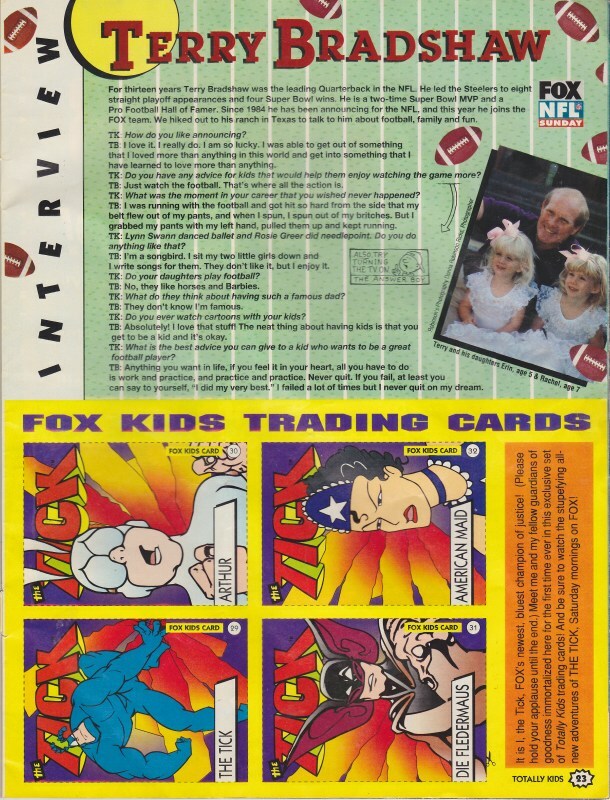 Fox Kids Club was a loose network of regional clubs for Fox TV affiliates. 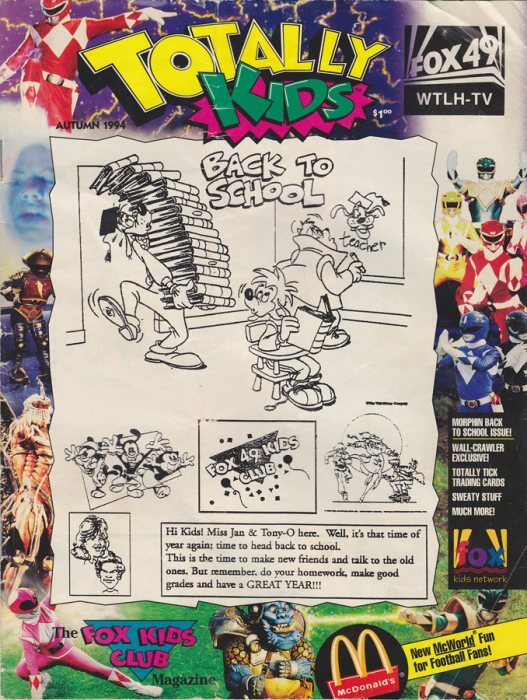 I was a member, so I got my own Fox Kids Club membership card and a subscription to the Totally Kids magazine. I recall Totally Kids being released four times a year. 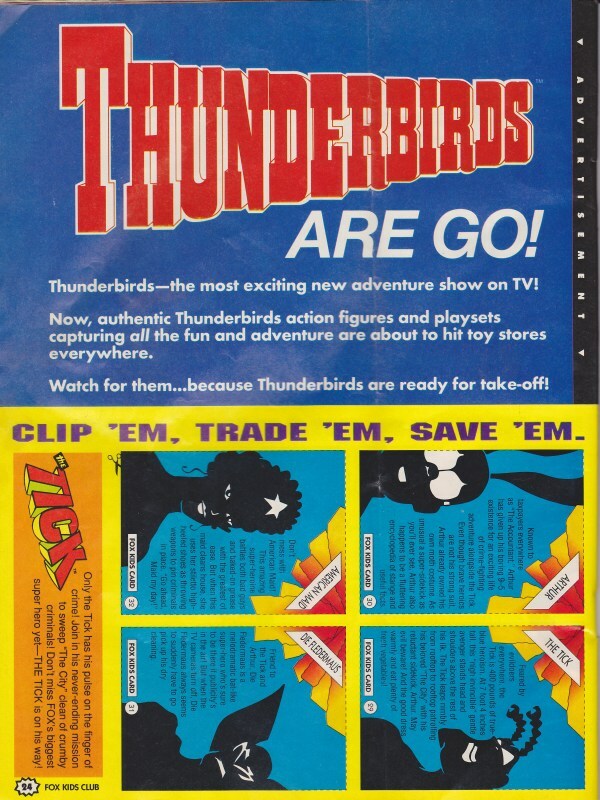 The one copy I have was when the Fox Kids lineup was at, or near, its peak. I liked looking forward to weekday afternoons and Saturday mornings. 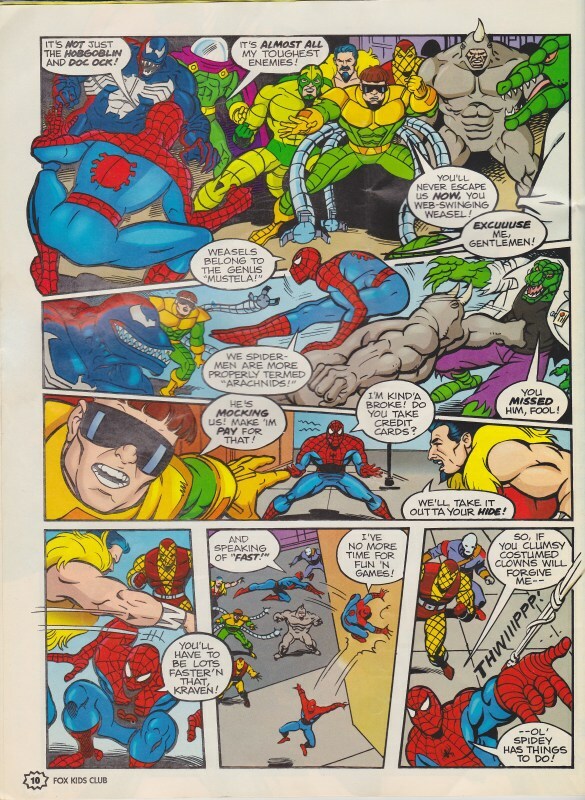 Huge favorites like X-Men, Batman: The Animated Series, and Animaniacs, while Spider-Man was getting ready to debut and The Tick finished its first season. 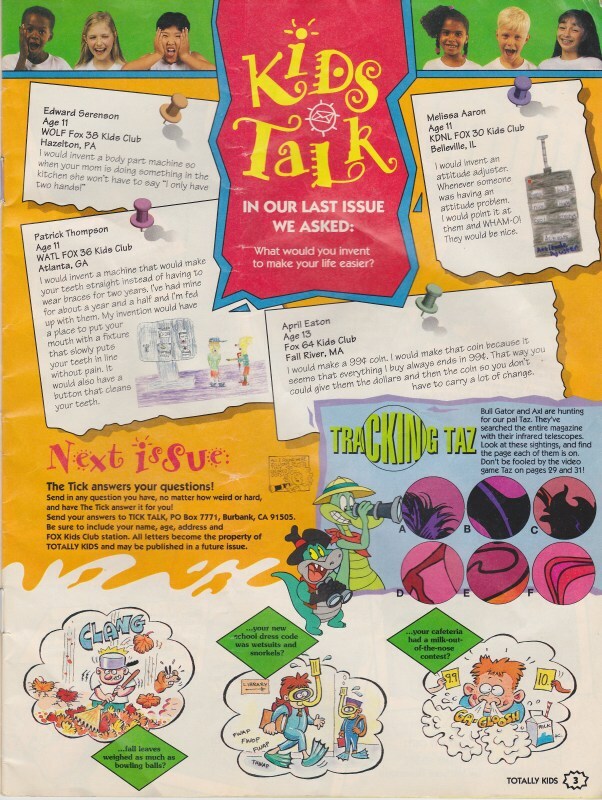 Bobby’s World was still running, the absurd Eek the Cat was on Saturday mornings, and I think Taz-Mania was still on Saturday mornings. The biggest hit and outright phenomenon, Mighty Morphin Power Rangers, is woefully underrepresented in this issue. During commercial breaks, our hosts Miss Jan and Tony O did…whatever they had to do to amuse us kids. I don’t have strong recollections of the Fox 49 WTLH promos. No, not Fox 49 Portland. I think the other nearby Fox affiliate WFXL had their own Kids Club, but since it was hard to pick up with an antenna, I never thought much of what that station was doing. I did meet Miss Jan once helping her set up a lecture she was doing at my school. I was no older than 10, so I don’t have any strong memories. The last I’ve read of her on the Interwebs many years ago is her receiving some award for teaching. Tony O, meanwhile, is a wedding singer according to his LinkedIn profile. The Fox Kids Saturday ended in the late 2000s. My local Fox station airs informercials in its place. Sniff, sniff. A lot of local Fox Kids stuff is on YouTube. 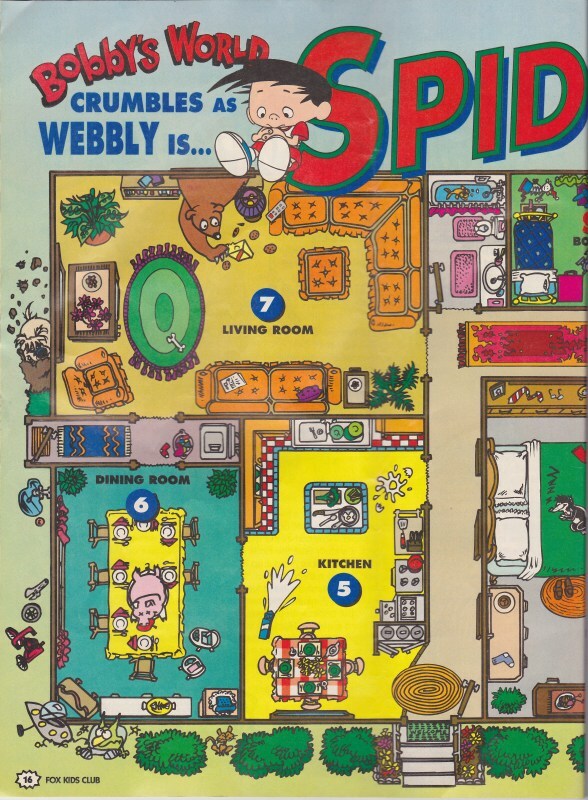 If you’re here to watch the old Fox shows, try Kids WB, Marvel.com, or even YouTube. Subscribers to Netflix can watch Spider-Man and X-Men. 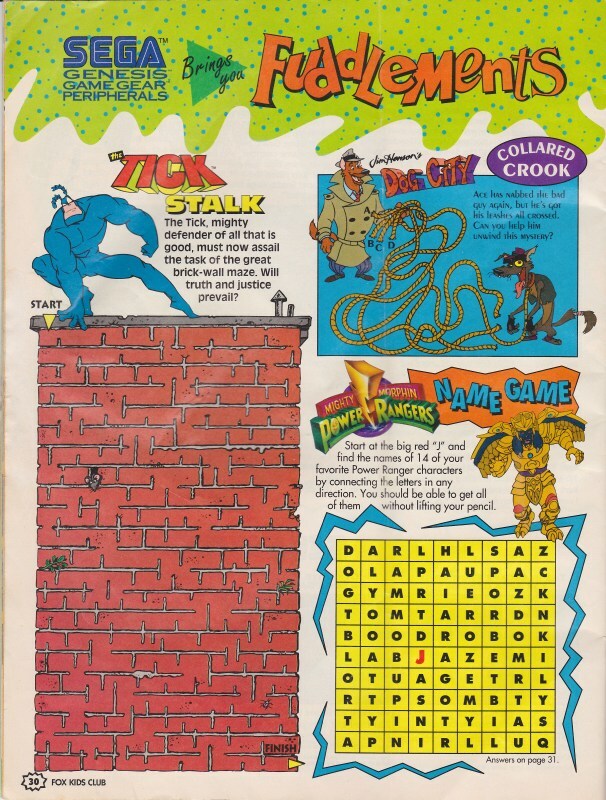 The gallery below are of selected pages of the Totally Kids magazine. It’s NOT the complete issue; I didn’t have time to scan all the pages. These are the most interesting parts to me. No, I don’t have any other issues. No, I’m too busy to scan the entire thing for you. It may turn up one day at this Totally Kids magazine collection. 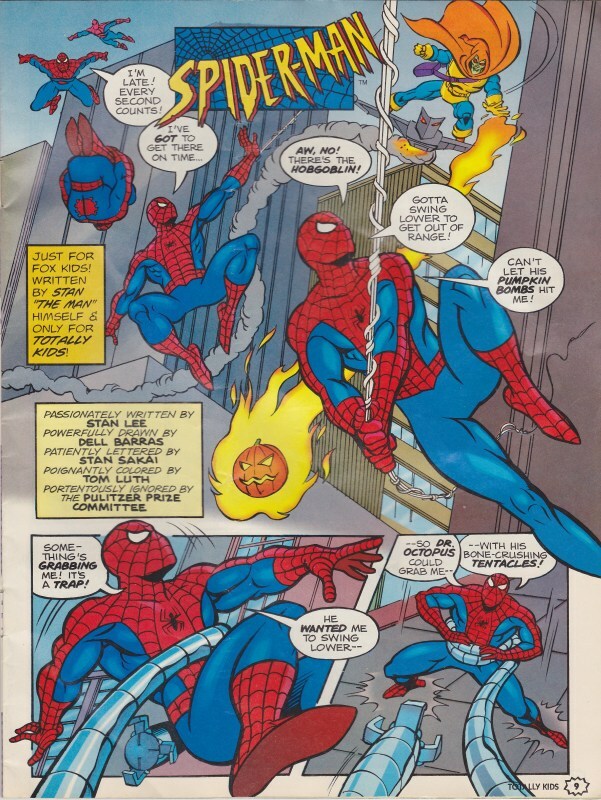 2-page Spider-Man comic written by Smilin’ Stan Lee himself! Though it must’ve been an easy payday. 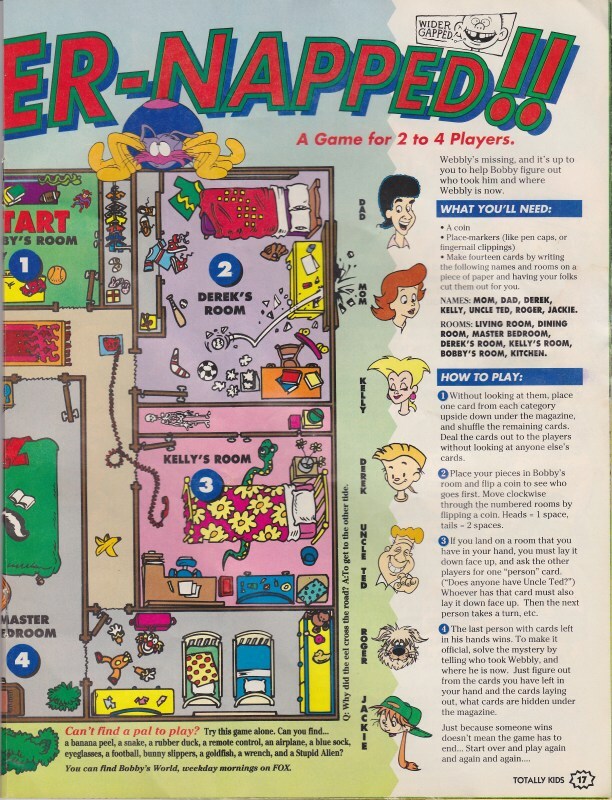 2-page Bobby’s World board game. 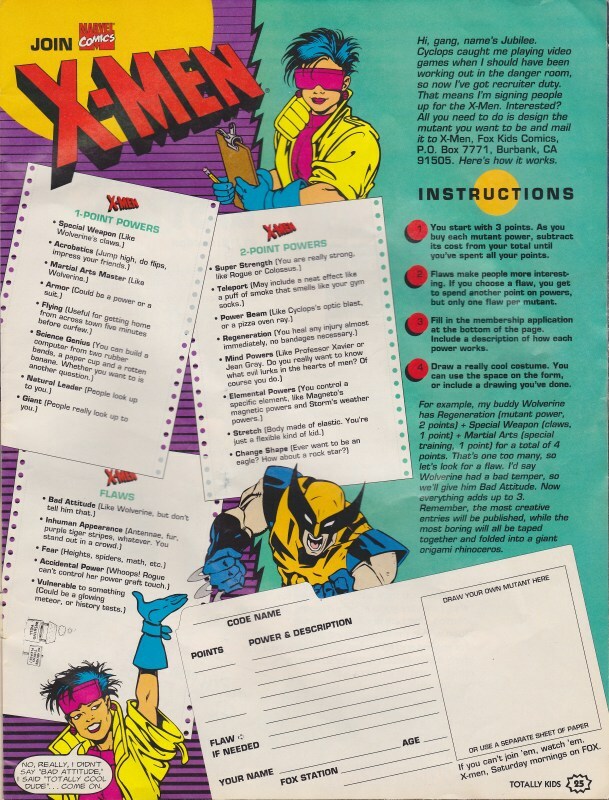 Instructions for X-Men pencil-and-paper game. Click each page for larger size. Please don’t hotlink. 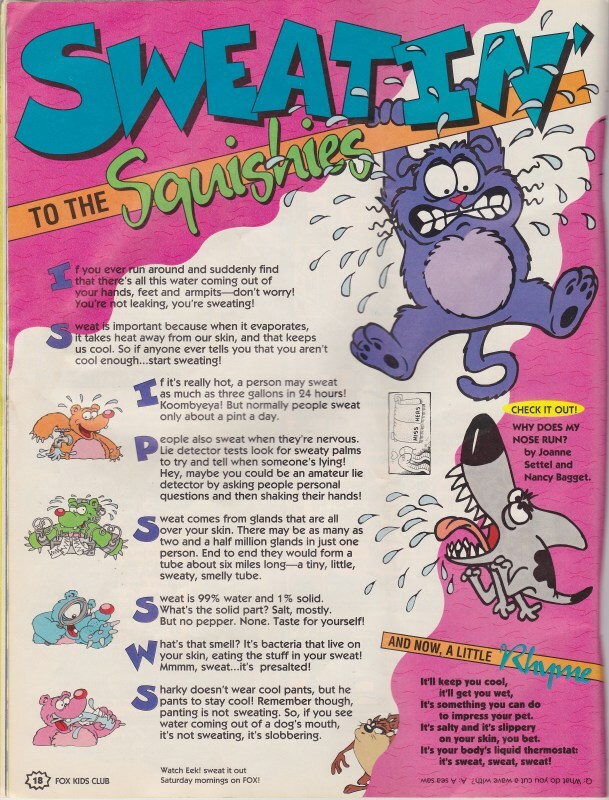 See also: ShezCrafti remembers Totally Kids and some other early 90s magazines. 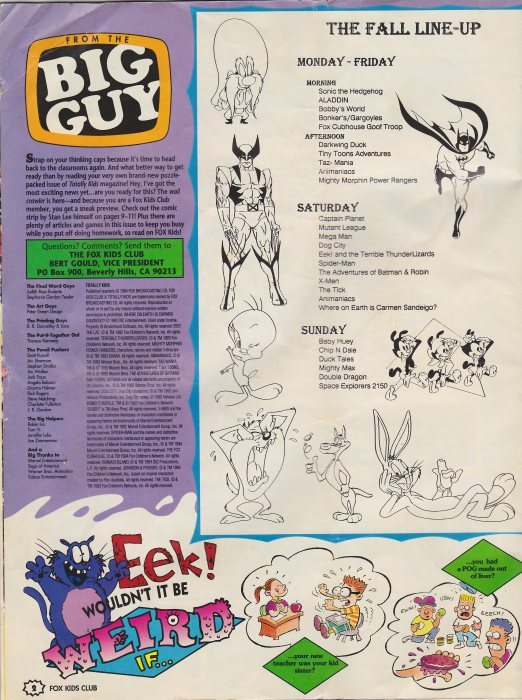 See also: Retro Junk’s remembrance about Fox Kids. Super-duper high quality Fox Kids logo found on Wikipedia. Hey, thanks for the link! 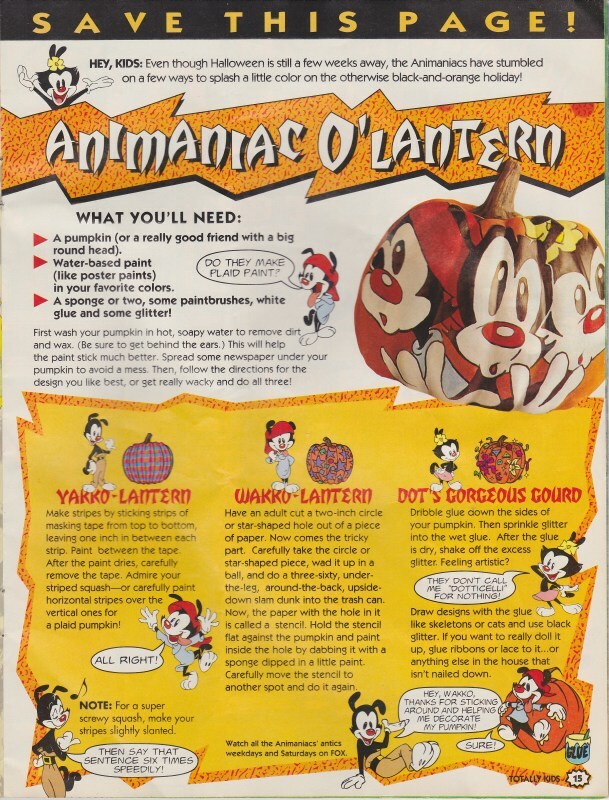 I totally remember this issue, too. That Eek! the Cat page is awesome.